Alexander Hale, 25, a philosophy major at Miami University of Ohio, enlisted in the Marine Corps after high school. He served as a logistics and embarkation specialist for Marine Fighter Attack Squadron 121. Alexander Hale, 25, says he hasn’t decided which presidential candidate he’ll vote for, but one issue is uppermost in his mind: the drop in military spending under President Obama.1 As a Marine Corps veteran, he says he hopes for a reversal of that cutback. Donald Trump, he says, is “more likely to start to put funding back into the military. The deployments will be there. There will be more options. Units won’t be hurting for funding so much.” That also might directly affect whether he chooses to rejoin. 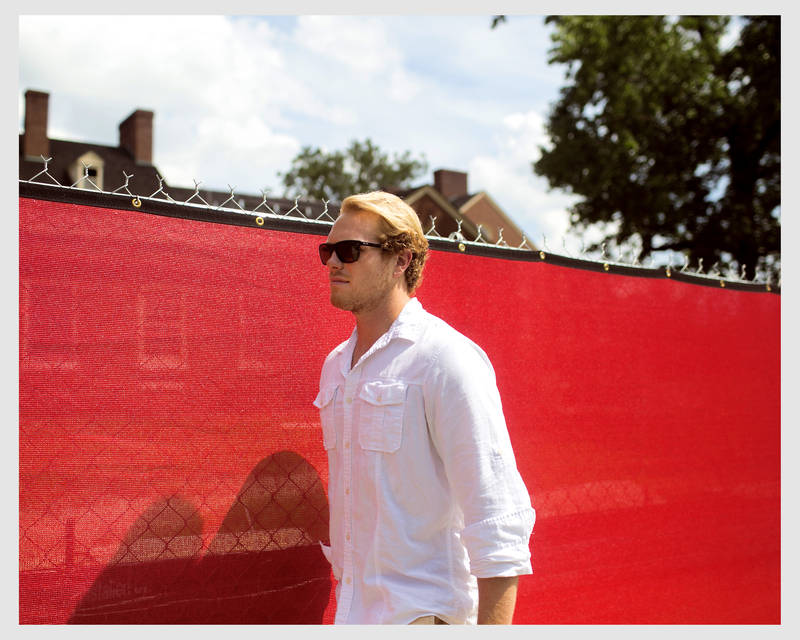 Hale, now a philosophy major at the Miami University of Ohio, is one of22 million veterans living in the United States, a powerful demographic group that trends Republican. There are also 1.3 million active-duty military members, 1.8 million dependents and nearly 741,000 U.S. civilian direct hires. Active-duty military service members are not allowed to speak on the record to the press about their political affiliations, but a July survey by Military Times (described as unscientific, since respondents opt in) found that they preferred Trump to Clinton 2 to 1, though the majority dislike both candidates (61 percent in Trump’s case and 82 percent in Clinton’s). 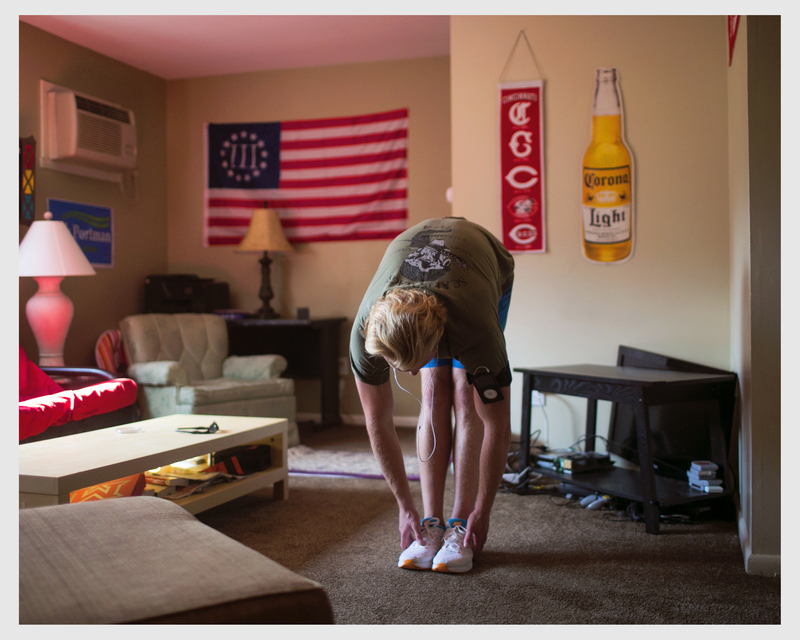 Hale, shown here stretching at his apartment before going for a jog, says he stays in shape to remain eligible to rejoin the military if he chooses. An NBC News/Survey Monkey poll in mid-August found that Trump was leading Clinton by 10 points — 51 to 41 percent — in military households, even after he angered many veterans groups by feuding with a Gold Star Muslim family that had lost a son in Iraq. (Blacks and Latinos in military households chose Clinton over Trump, though by lower margins than among the general population.) A Fox News poll in early August found Trump ahead of Clinton by 14 points in early August among veterans. But that lead is smaller than those of previous Republican candidates, possibly because of Trump’s remarks about the Gold Star family and his criticism of military interventions. At this point in the cycle, John McCain had a 22-point lead among veterans in 2008, and Mitt Romney was up 24 points in 2012. “Take our two iconic Vietnam vets — [Sen. John] McCain and [Secretary of State John] Kerry,” said Feaver, who held national security roles in the administrations of Bill Clinton and George W. Bush. “The Kerry version of the Vietnam vet is not going to find Trump appealing. And you might say the McCain version would, but one of Trump’s first actions was to mock McCain’s time as a POW. He also dodged the draft more noticeably than any other Republican candidate for president.” At the same time, he said, Clinton remains unpopular with many veterans, in part because of Benghazi and the cutback on military spending under Obama (though Clinton is likely to be more hawkish than Obama). With all this in mind, digging deeper into past voting patterns, veterans chose congressional Republicans by 20 points in 2014, and they voted for Mitt Romney by the same margin in the 2012 presidential election. Research by academics David L. Leal and Jeremy Teigen looked at the likelihood that veteran males identify as Republican and vote for Republican candidates when compared to similar non-veteran males. In 2008, they found a slight GOP advantage among veterans. About half of non-veterans voted for Obama, compared to 65 percent of veterans who voted for McCain. But in the most recent election, young veterans in their 20s — men who in 2012 were around Hale’s age — were more than twice as likely to vote for Mitt Romney compared to their non-veteran peers. Hale grew up in Liberty Township, Ohio. Right after he graduated from high school in 2009, he said, he was supposed to go to the nearby University of Cincinnati but didn’t enroll for classes because he wasn’t clear on what he wanted from school. Instead, after working for nearly a year, he enlisted in the Marine Corps and became a logistics and embarkation specialist for Marine Fighter Attack Squadron 121, which included F/A-18 fighter planes. Military families make up a substantial portion of the voting population and can have an outsize effect when concentrated in congressional districts and states. There are 19.4 million veterans, or about 8 percent of the adult population, according to the Department of Veterans Affairs, but there are millions more active-duty service members, reservists and military family members who are often included in military polls. According to figures from the Census’ American Community Survey, there are also districts in several swing states where veterans make up a disproportionate part of the adult population. Veterans are 17 percent of adults in the Florida’s 1st Congressional District, which includes Pensacola and its Naval Air Station, and which was once represented by the former congressman, and current MSNBC host, Joe Scarborough. In the state’s 11th District (along the Gulf Coast, north of Tampa and south of Gainesville), 16 percent of adult residents are veterans. All told, veterans make up at least 10 percent of the voting-age population in 15 of Florida’s 27 districts. Florida is also one of three states, in addition to California and Texas, with more than a million veterans. Other swing states with several districts rich in veterans include Virginia, North Carolina and Colorado. Veterans are at least 10 percent of the voting-age population in seven of Virginia’s 11 districts. In that state’s second district, which includes Virginia Beach and surrounding military installations, 18.6 percent of voting-age residents are veterans. Veterans are also more likely to vote than non-veterans. In 2012, 70 percent of veterans voted, compared with 61 percent of non-veterans; in the 2014 midterms, 54 percent of veterans voted, compared with 41 percent of non-veterans. Hale didn’t vote in 2012, but he plans to vote this year. He went to a Trump rally in Ohio after the GOP convention, in part because his former roommate works for Sen. Rob Portman, the Republican incumbent being challenged by Democrat Ted Strickland, the state’s former governor. Hale said Trump “brings a lot of energy” but he didn’t make a final decision based on the upbeat event. Hale’s ambivalence about his choices — and he says he’s still deciding — may reflect why there is less support among veterans for the GOP candidate than in previous years. Military spending fell from 20.1 percent of the 2010 federal budget to 15.9 percent five years later.